Rising senior Bridget Rickard, a Philosophy and Peace Studies major with a minor in the Catholic Social Tradition, has just concluded a trifecta of internships. Rickard’s D.C. internship also sparked her interest in the U.S. Foreign Service. 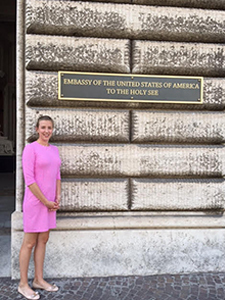 With funding from the Nanovic Institute for European Studies, she landed a summer internship in Rome at the U.S. Embassy to the Holy See. Her work included drafting cables, briefing books, and policy memos, duties that fostered valuable insight into career choices as well as a new perspective on the Catholic Church; Rickard decided against a U.S. Foreign Service career right now, and she came to recognize the multifaceted political role occupied by the Catholic Church. Professor Gerard Powers, Director of Catholic Peacebuilding Studies at the Kroc Institute, added: "Bridget’s three internships, as well as her work as a research assistant for the Catholic Peacebuilding Network, have given her an inside look at relationships between the Vatican, U.S., and the U.N., unmatched even by most specialists in the field. All of this is a testament to her initiative, her commitment to peace, and her unusual level of professionalism." Originally published by kroc.nd.edu at kroc.nd.edu on September 13, 2017.